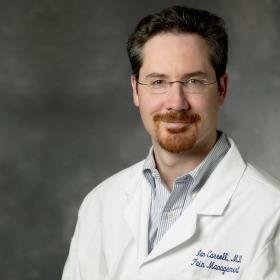 Ian Carroll is not your ordinary MD. For one thing, he’s an asst. professor at Stanford – not an easy position to snag. For another, he’s board-certified in no less than four different specialties (Headache Medicine, Addiction Medicine, Pain Medicine by the American Board of Anesthesiology; and Anesthesiology). That doesn’t happen often either. Plus, Carroll created the Stanford’s CSF leak program, AND its Peripheral Nerve Injury Pain Program. Carroll’s also conducted visiting professorships at a bunch of top medical centers (Johns Hopkins University, Vanderbilt University, Cedar-Sinai Medical Center, University of California at Davis Medical Center). Carroll, then, is the real deal – he’s a leader in his field. He’s not an expert in ANS issues but he was there to tell the audience that some people with POTS (or misdiagnosed with POTS) may instead have a condition which is treatable. That message was borne out of his own experience. His daughter had a spinal tap induced cerebral spinal fluid leak. She contacted Stanford, but since her headaches didn’t match the classic post-spinal tap headache picture (they persisted when she was lying down), a CSF leak was not at first suspected. She got an otherwise very good workup which, unfortunately, did not measure cerebral spinal fluid protein, include a brain MRI nor spinal imaging. Ultimately it was determined she had a spinal fluid leak; she received treatment and improved greatly. CSF leaks are no joke. They can be disabling, ruin careers and unfortunately, not be diagnosed for decades. They’re another in that swarm of diseases (POTS/MCAS/ME-CFS/EDS, FM) which are often unrecognized by doctors, produce similar symptoms and are often untreated. Misdiagnoses of CSF leaks are common and usually include chronic migraines, chronic fatigue syndrome (ME/CFS), fibromyalgia, POTS, chiari malformation and Tarlov cysts. The cardinal symptoms of a cerebral spinal fluid (CSF) leak are similar to POTS; in fact, Carroll reported that the top eight symptoms are the same. They include feeling worse when upright, neck pain, headache, tinnitus, cognitive issues (getting lost driving to familiar places), nausea and vomiting. Since his daughter became ill, Carroll’s been having POTS, ME/CFS, EDS and other patients referred to him at Stanford and he’s found some people with these diagnoses actually have cerebral spinal fluid leaks. His first referred POTS patient turned out to have a CSF leak. Except for her symptoms (severe headaches, passing out for 10 years) he had nothing to go on: her initial imaging appeared to be negative and an MRI showed no signs of intracranial hypotension, but when he “patched her” she got better. Carroll noted that no one knows how effective a tilt table test is at distinguishing between cerebral spinal fluid leaks and POTS as no studies have been done. One possible distinguishing symptom may be tinnitus; it’s very common in CSF leaks and does not appear to be as common in POTS. Check out an ME/CFS patient’s description of her appointment with Dr. Carroll. The good news is that many CSF leaks can be successfully treated. Severe headaches, pain, fatigue, exercise issues, and cognitive issues can all be diminished significantly or even drop away entirely. He’s seen ME/CFS/FM patients resume normal lives after a single blood patch. Most CSF leaks occur when the dura – the covering that surrounds the spinal cord and the brain – gets punctured. Because the dura holds the spinal fluid which protects the spinal cord and the brain, a tear can lead to reduced spinal fluid pressure, orthostatic headaches, and other symptoms when upright or standing. Dural tears can be caused by medical procedures (spinal taps/lumbar punctures, epidurals), bone spurs, trauma (e.g. whiplash), or if you happen to have genetically weak dura. Other conditions that increase the risk of CSF leaks include being unusually tall (>6’2″ or short, having a degenerative disc disease (see below) and/or scoliosis, diffuse arthritis, a history of aneurysm, and early onset cataracts (age 40)). A significant number of people with CSF leaks cannot, however, identify a triggering cause. The Connective Tissue Angle – Having Ehlers-Danlos syndrome or Marfan syndrome greatly increases your risk of having a CSF leak. Because of that, Carroll asserts that anyone with a suspected CSF leak should take the Beighton Hypermobility test. A Beighton score between 3-5 suggests a hereditary connective tissue disorder may be present. Whiplash – Stating that CSF leaks are very common after a whiplash injury, Carroll suggested that if you had whiplash before getting sick, you should strongly consider whether you have CSF leak. A Japanese study of 66 patients, whom after a whiplash injury complained of chronic fatigue, memory problems, neck and head pain, found that about half had a CSF leak. Getting patched allowed half of those who were unable to work to go back to work. Leaks associated with a dural puncture or spinal tap are usually limited to a single leak site in the lower back, are well understood medically, and usually resolve quickly. If a patch is needed, it’s usually successful. In contrast, spontaneous CSF leaks often rise mysteriously, are poorly diagnosed, and less easily treated. Mornings are usually better. Symptoms can get immediately worse upon standing, but not always. Tell tale signs of a CSF leak are worsening symptoms the longer you’re upright (sitting or standing) and symptoms which worsen later in the day. Severe headaches are a major feature of a CSF leak. Some people who’ve had a spinal tap are probably acutely aware of what a CSF leak headache can feel like, but dural puncture/spinal tap induced CSF leaks and spontaneous (non-dural puncture triggered) CSF leaks are different. People with post-puncture CSF leaks usually get slammed with a piercing, sometimes mind-boggling headache when they rise up, which then quickly disappears when they lie back down. Over time, some CSF-caused headaches can become chronic, occurring whether you’re lying down or standing up. Tinnitus may be a distinguishing feature between POTS and CSF leaks. Carroll suggested that if you have tinnitus in the absence of headaches, “you should be thinking that there is something else going on”. That’s because either abnormally low or high cerebral spinal fluid pressure can alter the pressure of the fluid in the inner ear as well, causing tinnitus. For some, nausea and vomiting are their main symptoms. In a Neurology Reviews article Dr. Carroll described a complex regional pain syndrome patient who suffered a CSF leak during a spinal cord stimulation trial, and subsequently vomited up to nine times a day. It took two CT myelograms to find the very small leak. After treatment, she improved markedly. CSF leaks can cause a wide variety of other common symptoms including neck pain, fatigue, trouble concentrating, trouble persisting with task, and a racing pulse. It can also, at times, cause bizarre symptoms including: double vision, blurred vision, patchy numbness or tingling in the face or limbs, unusual smells (experienced as smelling odors that others don’t), sensitivity to light (photophobia), muffled hearing, sensitivity to sounds and smells, and strange taste sensations such as a persistent metallic taste. Many doctors think MRI’s will provide evidence of the low cerebral spinal fluid pressure that’s characteristic of CSF leaks, but Carroll has had numerous patients with normal MRI’s whose headaches disappeared with treatment. In his experience, CT myelograms are needed to find many of them and even they can miss some leaks. Carroll relayed the story of one person who suffered from terrible headaches, nausea and grand mal seizures. His MRI showed an innocuous little disc bulge, but a myelogram showed a sharp edge piercing his spinal cord. He had a blood patch and recovered. About half the people with CSF leaks have elevated levels of protein in their cerebral spinal fluid. It was apparently long thought that CSF leaks resulted in increased CSF pressure, particularly since increased prolactin levels are sometime found in people with CSF leaks. (Increased cerebral spinal fluid pressure can put pressure on the pituitary gland, resulting in elevated prolactin levels.) A study which found no evidence of altered cerebral spinal fluid pressure in patients with CSF leaks indicated, though, that normal CSF pressure (65-195 mm/H20) does not mean that a leak is not present. Treatment is usually very simple. It usually involves a “blood patch” which involves a small amount of the patient’s blood being injected near the site of the tear. The blood clot which forms then patches the leak. About 30-40% of people with spontaneous CSF leaks have multiple leaks. These types of leaks are more difficult to treat because the leaks are usually in more difficult places to “patch” and may take multiple patches to heal. Still, the problems are resolved with one patch in about 30% of causes. Success rates with multiple patches may approach 75%. If blood patches don’t work, fibrin “glue” seals or surgery can be used to close the tear. Unfortunately, no studies have determined how many people with ME/CFS, FM, POTS, EDS or other allied diseases actually have a cerebral spinal fluid leak. It may be a few, it may be more, but Carroll is clear that at least for some people a potentially corrective treatment awaits. Read Carolynn Christian’s account of her appointment with Dr. Carroll – Through the Looking Glass: Cerebral Spinal Fluid Leaks & Ehlers Danlos Syndrome – an Alternate Reality to ME/CFS? I may very well be a person that may be helped by one or more of these patches. However, how the heck can I find a doctor that will even listen to me about this, understand what I would be talking about, test me properly for this, and then fix it for me? I live in west central Florida and am again looking for a PCP who will be willing to take me on as a patient. In the past 5 years, I have been “fired” as a patient because they don’t know how to take care of me with my multitude of medical problems. Right now, I only have my Rheumatologist taking care of me, but he can’t be my PCP. You might want to contact Dr. Carroll’s office to see if they have any suggestions. He’s a real leader in this field. Thanks for letting us know. I will pass that on. In my multi-year journey to diagnose my illness I went to the USC headache center in around 2013 and the good Doctor thought I had a CSF leak. I live in Northern Ca. and asked for a referral to Stanford since it was much easier to access. The insurance company would not okay all four MRI’s with and without contrast I needed for a diagnosis. So I paid for half out of pocket and there was no evidence of a leak. I then had a lumbar puncture to make sure and I was at the high end of the normal pressure range. I was very happy for a while thinking I finally knew what was wrong. I finally found I had Lyme’s after 5 years. The lumbar puncture was of some value with tests on the fluid. Yes, it appears that high intracranial pressure is not synonymous with a CSF leak – although I do wonder if someone who already had high intracranial pressure with a CSF lead would still have moderately high pressure (???) I have no idea..
Wow, this makes me again wonder, I had severe whiplash from car accident 2005, I felt all these button like discs pop out in the back of my neck? I could actually touch each one. My concussion made my head feel like it was huge , and filled up with jelly. My neck continued to swell for 2 months after, I ended up with trigger point injections because my muscles were knotted across my upper back, it didn’t help at time that I had 3 more , cervical, throartic, lumbar at open MRI and they found only mild retentive disc disease in cervical area, but when it was repeated, I had bone spurs, osteophytes, multi level cervical stenosis, a exray found congentical fused t5-t6 vertabrae, and lumbar- small areas of abnormal signal intenscity consistant with foci of bone marrow, edema along anterior and superior margins of L3, L4, L5 vertabrae, I was diagnosed with fibromyalgia, reactive arthritis,perihial neuropathy by Emg, anterior pituitary hormones deficiencies disorder, adrenal deficiencies, chronic Glomerulonephritis Kidney disease,etc..I suffer constantly with dehydration, vision problems, blurred at times, over sentitve to light, migraines with aura, right side mastoiditis,pineal cyst, mild prominence of nasopharyngeal soft tissue, mild prominence of cystic adenoid lymphoid tissue, back pain, neck pain, especially when bending or hunching over…Ebv I’m negative but vca IGG and Ebna IGG also very high, endrocrinist asked me why was this? 3 Lyme test high postive Elisa, but negative western, My nose always drips clear, non stop, and I am now choking while swallowing fluid and food? Its almost like i’m sneezing as i swallow? I can’t find any Dr’s with a knowledgeable answer to why so many tests, Kris , blood etc are abnormal? And even when MRI suggests follow up with cat scan. It’s ignored. If I had away to leave RI and stay at mass hospital for testing I’d do it in a 2nd. Because I seem to have so many of the symptoms of Carol, and my whiplaSh was severe enough to damage pituitary gland, I wouldnt be surprised at all if it did the same to my spine and caused a fluid leak? I have 4 bone spurs on cervical levels in my neck only? But where are the specialists? Especially in RI? I have a history of lower back pain and have undergone multiple esi injections.I had not had much pain during the procedures but I had one on January 8 2015 that was quite different I began to have extreme pain upon inserting of the needle and i began to scream I intimately finished and was informed that something was wrong that it shouldn’t have been so painful.I was released and within a few days started to have severe headaches and pressure behind my eyes and for a while confusion I also had a problem swallowing for a few days and change in my voice but the swallowing and voice have subsided but I have started to have hypersensitive hearing where sound is extreme and i have tinnitus and have started to have pain between my shoulders and in my neck but the most noticeable problem is headache with pressure behind my eyes and this seems worse when my eyes are opened I have tried to get this investigated but have not had any success as I am uninsured and unable to work and the only facility within my area is also the same as the one who did the esi and may well have financial reasons why my suspicions have gone without notice. I believe I may have a CSF leak does this sound likely given I never had headaches or pain in any part except my lower back prior to the esi. Could a condition of Ehlers Danlos/hyper mobility cause CFS leaks?